Steiff Paradise Jungle Collection. Margarete Steiff GmbH Limited Edition teddy bear and ape friend Set. 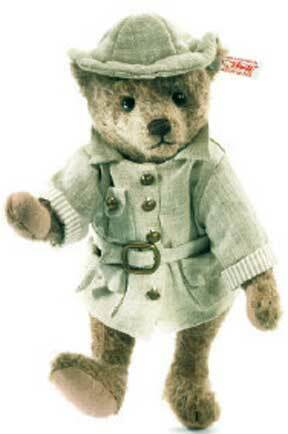 Handmade in Germany with the famous "button in the ear" Steiff trademark tags. Best friends living in paradise. That is Johnny and Jocko, the perfect pair. Johnny is made from felted cafe-au-lait Mohair and stands 31 centimeters, 12.20 inches tall. He features delicately hand-airbrushed details on his chest, paw pads, ears, and muzzle. He wears a leopard-pattern lined loincloth - and a big game tooth on a cord around his neck. Johnny's friend, the ape Jocko, is based on the classic miniature 12-centimeter Jocko design highlighted by time-consuming airbrushed painting on the face, feet, and hands. Both Johnny and Jocko are 5-way jointed. Exploring Paradise Jungle is more fun with friends along. Why not invite Johnny and Jocko? Handcrafted in Germany with you in mind. Paradise Jungle Collection Limited Edition of 1,500. STEIFF EAN# 035104.